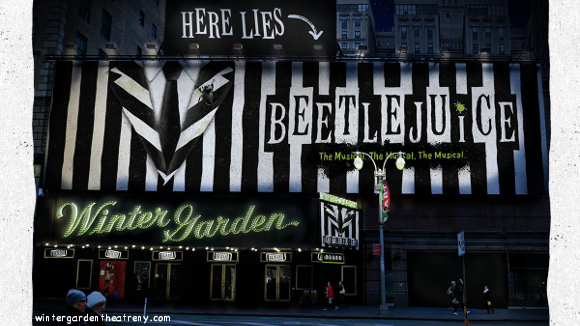 Get ready for the latest stage adaption of another classic comedy classic – that’s right, ladies and gentlemen, get ready to welcome Tim Burton’s Beetlejuice to the Winter Garden Theatre in its grand Broadway opening! Following the story of two couples – one recently deceased, the other living – as they fight for control of a single home and invoke the help of the ill-willed poltergeist Beetlejuice, who has his own ideas about how things should go. Hilarious, raucous, and irreverent, Beetlejuice is the perfect comedy horror to see round Halloween or any time at all! Choose your show from the list below and book early to get the best seats! The story of Beetlejuice follows that of the Maitlands couple, who, upon returning to their country home, find they have died in a car crash on the way there. Unfortunately, they have to wait 125 years in their home before they can proceed to the afterlife – but another couple, the Deetzes, and their gothic teenage daughter, Lydia, are moving into the property and are intent upon renovating it. The Maitlands attempt, unsuccessfully, to drive the Maitlands from the property, but in doing so befriend Lydia, who suggests they call upon Betelgeuse (pronounced “Beetlejuice”), who can be summoned by repeating his name three times, to help them. However, even here things don’t go quite according to plan, as Beetlejuice has his own plans. The Beetlejuice musical premiered pre-Broadway at the National Theatre in Washington, D.C, for a one-month run from October 14 to November 16. 2018. Following the warm reception of the tryout, the musical moved to open officially on Broadway at New York’s Winter Garden Theatre. The musical is directed by Alex Timbers, a Tony Award nominee, with a book by Anthony King and Scott Brown and a score by the Australian Eddie Perfect, making his debut in the US. The team behind the musical includes set design by David Korins, costume design by William Ivey Long, lighting design by Kenneth Posner, sound design by Peter Hylenski, projection design by Peter Nigrini, puppet design by Michael Curry and other special effects by Jeremy Chernick, illusions by Michael Weber, music production by Matt Stine and choreography by David Dabbon. 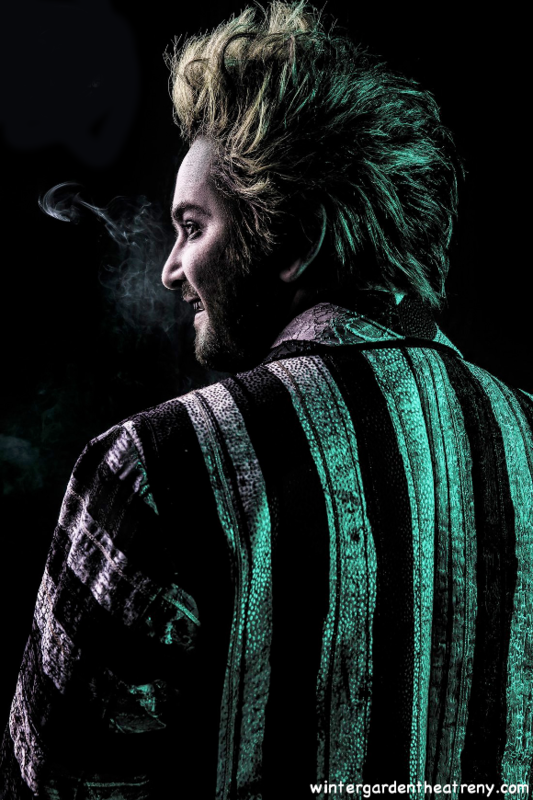 In the musical so far, with his portrayal by Alex Brightman, Beetlejuice’s character has taken on a new vibe – younger, less obviously exaggerated, but still with the same impish energy and instantly recognisable striped suit. This is one of several important shifts in the direction of the musical from the film, which seeks to provide a new experience for fans of the original while still paying homage to it. Part of this involves putting more of the spotlight on the titular character and his motives and personality, in addition to Lydia, a key player in causing the important events of the story to unfold. While being entertained with new material and surprises, fans of the original film will be kept happy with a script that overall closely follows the storyline of the 1988 classic. The directors and producers have been very careful to add just enough new changes and depth to enhance, rather than take away from, audience’s pre-existing Beetlejuice conceptions, exactly as any good adaption should. Get ready for a story you already love and some new twists to take you unawares! Fans of the original film can’t afford to miss this – and if you haven’t seen that either, you’re in for a wild ride! Don’t miss out – get your tickets to see the hilarious, uproarious Beetlejuice Broadway musical today, before all of the good seats go!